There's been sick peeps around these parts. Up all hours, lots of washing, squeezing juices and making soup. But I'm not getting sick. Not me. Too busy thanks. Around all the nursing, we're fiddling around with the kitchen trying to prepare for the big arrival. For a long time now we've been on a mission. 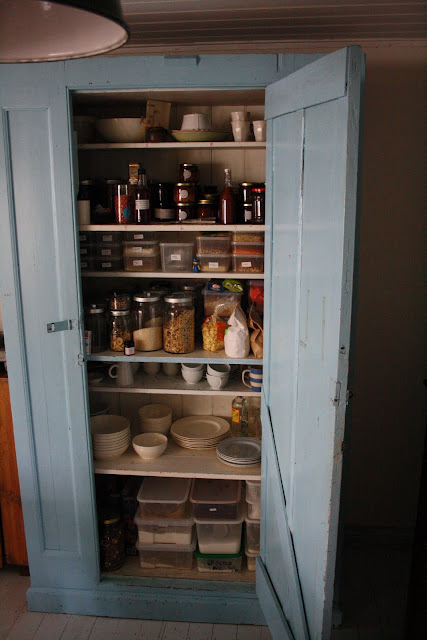 One to find the perfect pantry cupboard. We've hunted and scoured for such a long time. We like those old pine dressers, you know, the farmhouse type ones. But they just don't hold enough stuff. Book shelves, stainless steel racks, we've thought about of all types of storage solutions but we were prepared to wait until we found just the right piece. However, as we ripped out the last of our existing built-in cupboards to make way for the hearth, things started to get desperate. Nothing like having your pantry stacked in boxes on the floor to take the joy out of cooking. Perhaps we were going to have to get something custom made. Like, right now. When suddenly, there it was. A giant blue vision at the local second hand store. It was massive, it was loaded with shelves. And it was perfect. I love that it came from an old girl guides hall. It has £ 8-0-0 written in yellow handwriting on the side and is 235 centimetres tall. And now it lives with us. Of course, there isn't quite enough room to fit all of our things. But really, can you ever have a big enough pantry? I'm just so happy we found it, that it just fits under our ceiling, and that it's painted the most lovely shade of blue. And that it has found a home here with us. Oooh, it sure is lovely. I would like one too. I love waiting for the perfect piece to appear. It's so much better than buying something new, for the earth & the hip pocket. Love it, storage is pretty important to being happy in the kitchen. Wow once "it" arrives you won't know yourself in your new kitchen! How nice to gaze upon a perfectly timed find after my own day of "sick peeps, up all hours, lots of washing, squeezing juices and making soup"
Thank goodness for the sunshine to dry all the washing and to sit around in. Fingers crossed I'm not in for another round tonight! We picked up exactly the same green pendants as yours at an auction recently! Love 'em. That's a truly lovely thing. Nice wire baskets too. I am so envious - I love it, love it!!! Your patience was completely rewarded. It looks fantastic. Oh my! That is amazing. I really, really like your new pantry. I like how organised it is inside too! I love it, and in blue. I feel I need to organise my pantry this weekend after seeing yours. I can empathise on being pantry-less. I use two underbench cupboards and a set of wooden shelves. Your new pantry is perfect! I just cleaned and repack my pantry,still got stuff on the counter, nowhere to go with it. Just love your pantry and it's a wonderfullperriwinlke blue, to beautiful. You can never have enough storage.